This article is about the color. For other uses, see Indigo (disambiguation). "Violet-blue" redirects here. For other uses, see Violet blue (disambiguation). Indigo is a deep and rich color close to the color wheel blue (a primary color in the RGB color space), as well as to some variants of ultramarine. It is traditionally regarded as a color in the visible spectrum, as well as one of the seven colors of the rainbow: the color between violet and blue; however, sources differ as to its actual position in the electromagnetic spectrum. Species of Indigofera were cultivated in East Asia, Egypt, India, and Peru in antiquity. The earliest direct evidence for the use of indigo dates to around 4000 BC and comes from Huaca Prieta, in contemporary Peru. Pliny the Elder mentions India as the source of the dye after which it was named. It was imported from there in small quantities via the Silk Road. The Ancient Greek term for the dye was Ἰνδικὸν φάρμακον ("Indian dye"), which, adopted to Latin as indicum and via Portuguese gave rise to the modern word indigo. 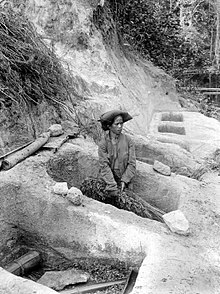 Spanish explorers discovered an American species of indigo and began to cultivate the product in Guatemala. The English and French subsequently began to encourage indigo cultivation in their colonies in the West Indies. Blue dye can be made from two different types of plants: the indigo plant, which produces the best results, and from the woad plant Isatis tinctoria, also known as pastel. For a long time woad was the main source of blue dye in Europe. Woad was replaced by true indigo as trade routes opened up, and both plant sources have now been largely replaced by synthetic dyes. The Early Modern English word indigo referred to the dye, not to the color (hue) itself, and indigo is not traditionally part of the basic color-naming system. Modern sources place indigo in the electromagnetic spectrum between 420 and 450 nanometers, which lies on the short-wave side of color wheel (RGB) blue, towards (spectral) violet. 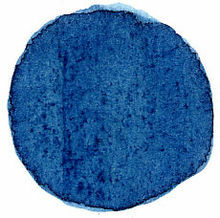 However, the correspondence of this definition with colors of actual indigo dyes is disputed. Optical scientists Hardy and Perrin list indigo as between 445 and 464 nm wavelength, which occupies a spectrum segment from roughly the color wheel (RGB) blue extending to the long-wave side, towards azure. 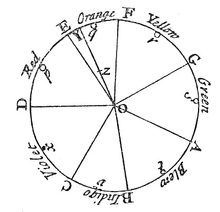 I desired a friend to draw with a pencil lines cross the image, or pillar of colours, where every one of the seven aforenamed colours was most full and brisk, and also where he judged the truest confines of them to be, whilst I held the paper so, that the said image might fall within a certain compass marked on it. And this I did, partly because my own eyes are not very critical in distinguishing colours, partly because another, to whom I had not communicated my thoughts about this matter, could have nothing but his eyes to determine his fancy in making those marks. The human eye does not readily differentiate hues in the wavelengths between what we today call blue and violet. If this is where Newton meant indigo to lie, most individuals would have difficulty distinguishing indigo from its neighbors. According to Isaac Asimov, "It is customary to list indigo as a color lying between blue and violet, but it has never seemed to me that indigo is worth the dignity of being considered a separate color. To my eyes it seems merely deep blue." The color electric indigo is a bright and saturated color between the traditional indigo and violet. This is the brightest color indigo that can be approximated on a computer screen; it is a color located between the (primary) blue and the color violet of the RGB color wheel. "Electric indigo" is brighter than the pigment indigo reproduced below. When plotted on the CIE chromaticity diagram, this color is at 435 nanometers, in the middle of the portion of the spectrum traditionally considered indigo, i.e., between 450 and 420 nanometers. This color is only an approximation of spectral indigo, since actual spectral colors are outside the gamut of the sRGB color system. At right is displayed the web color "blue-violet", a color intermediate in brightness between electric indigo and pigment indigo. It is also known as "deep indigo". The color box at right displays the web color indigo, the color indigo as it would be reproduced by artists' paints as opposed to the brighter indigo above (electric indigo) that is possible to reproduce on a computer screen. Its hue is closer to violet than to indigo dye for which the color is named. Pigment indigo can be obtained by mixing 55% pigment cyan with about 45% pigment magenta. Web color indigo represents the way the color indigo was always reproduced in pigments, paints, or colored pencils in the 1950s. By the 1970s, because of the advent of psychedelic art, artists became used to brighter pigments, and pigments called "bright indigo" or "bright blue-violet" that are the pigment equivalent of the electric indigo reproduced in the section above became available in artists' pigments and colored pencils. 'Tropical Indigo' is the color that is called añil in the Guía de coloraciones (Guide to colorations) by Rosa Gallego and Juan Carlos Sanz, a color dictionary published in 2005 that is widely popular in the Hispanophone realm. 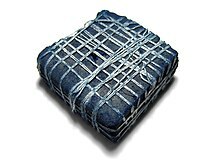 Indigo dye is a greenish dark blue color. The indigo bunting, native to North America, is mostly bright cerulean blue with an indigo head. The related blue grosbeak is, ironically, more indigo than the indigo bunting. Marina Warner's novel Indigo (1992) is a retelling of Shakespeare's The Tempest and features the production of indigo dye by Sycorax. IndiGo Airlines is an Indian budget airline that uses an indigo logo and operates only Airbus A320s. Indigo Line, a proposed MBTA commuter rail line, is set to open in 2024. In Mexico, indigo is known as 'añil'. After silver, and cochineal to produce red, añil was the most important product exported by historical Mexico. Scientists discovered in 2008 that when a banana becomes ripe and ready to eat, it glows bright indigo under a black light. Some insects, as well as bats and birds, may see into the ultraviolet, because they are tetrachromats and can use this information to tell when a banana is ripe and ready to eat. The glow is the result of a chemical created as the green chlorophyll in the peel breaks down. The French Army adopted dark blue indigo at the time of the French Revolution, as a replacement for the white uniforms previously worn by the Royal infantry regiments. In 1806, Napoleon decided to restore the white coats because of shortages of indigo dye imposed by the British continental blockade. However, the greater practicability of the blue color led to its retention, and indigo remained the dominant color of French military coats until 1914. The spiritualist applications use electric indigo, because the color is positioned between blue and violet on the spectrum. ^ a b Rosen, Joe (26 June 2017). Encyclopedia of Physics. Infobase Publishing. ISBN 9781438110134 – via Google Books. ^ W3C TR CSS3 Color Module, SVG color keywords. W3C. (May 2003). Retrieved on 14 December 2007. ^ Splitstoser, Jeffrey C.; Dillehay, Tom D.; Wouters, Jan; Claro, Ana (September 2016). "Early pre-Hispanic use of indigo blue in Peru". Science Advances. 2 (9): e1501623. doi:10.1126/sciadv.1501623. PMC 5023320. PMID 27652337. ^ "Night of the Indigo". harappa.com. Retrieved 20 May 2016. ^ Robin J. H. Clark, Christopher J. Cooksey, Marcus A. M. Daniels, Robert Withnall: "Indigo, woad, and Tyrian Purple: important vat dyes from antiquity to the present", Endeavour 17/4 (1993), 191–199. ^ Ἰνδικός in Henry George Liddell. Robert Scott. A Greek-English Lexicon. revised and augmented throughout by. Sir Henry Stuart Jones. with the assistance of. Roderick McKenzie. Oxford. Clarendon Press. 1940; English indigo since the 17th century, changed from 16th-century indico. ^ Pritchard, James (2004). In Search of Empire: The French in the Americas, 1670–1730. Cambridge: Cambridge University Press. p. 127. ^ "Getting the blues: the pastel trade in southwest France". Life on La Lune. 22 May 2011. Retrieved 23 February 2018. ^ Ottenheimer, Harriet Joseph (2009). The anthropology of language: an introduction to linguistic anthropology (2nd ed.). Belmont, CA: Wadsworth. p. 29. ISBN 978-0-495-50884-7. ^ Group, The HURIS. "Spectrum of Electromagnetic Radiation ( EMR )". www.huris.com. ^ "VIBGYOR Color Segmentation – File Exchange – MATLAB Central". www.mathworks.com. ^ Allen, O.N. Allen & Ethel K. (1981). The Leguminosae: a source book of characteristics, uses, and nodulation (null ed.). Madison, Wisc. : University of Wisconsin Press. p. 343. ISBN 978-0-299-08400-4. ^ Brewster, David (1855). Memoirs of the life, writings and discoveries of Sir Isaac Newton, Volume 1. p. 408. ^ Ronchi, Lucia R.; Jodi Sandford (2009). The Excentric Blue. An Abridged Historical Review. Fondazione Giorgio Ronchi. ISBN 978-88-88649-19-1. ^ McLaren, K. (March 2007). "Newton's indigo". Color Research & Application. 10 (4): 225–∠229. doi:10.1002/col.5080100411. ^ J. W. G. Hunt (1980). Measuring Color. Ellis Horwood Ltd. ISBN 978-0-7458-0125-4. ^ Craig F. Bohren and Eugene E. Clothiaux (2006). Fundamentals of Atmospheric Radiation. Wiley-VCH. ISBN 978-3-527-40503-9. ^ Forret, Peter. "RGB Color converter – toolstudio". web.forret.com. ^ Kitchin, Thomas (1778). The Present State of the West-Indies: Containing an Accurate Description of What Parts Are Possessed by the Several Powers in Europe. London: R. Baldwin. p. 30. ^ Gallego, Rosa; Sanz, Juan Carlos (2001). Diccionario Akal del color. Akal. ISBN 978-84-460-1083-8. ^ Graham, Lanier F. (editor) The Rainbow Book Berkeley, California:1976 Shambala Publishing and The Fine Arts Museums of San Francisco (Handbook for the Summer 1976 exhibition The Rainbow Art Show which took place primarily at the De Young Museum, but also at other museums) Indigo Pages 152–153 The color indigo is stated to represent intuition.